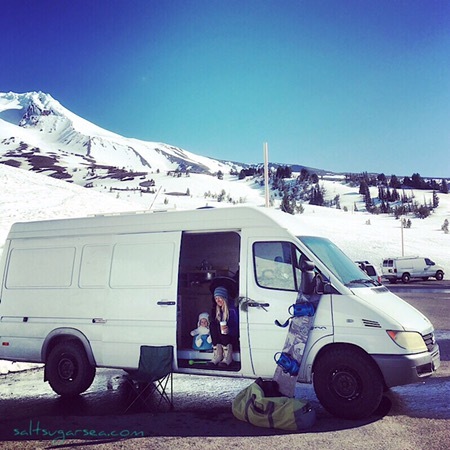 Vanlife Log. Day 6. 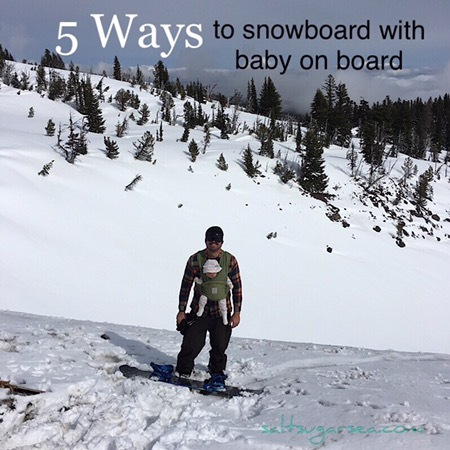 We have been trying to figure out how to snowboard with baby on board for over a year now. None of what we have learned is perfect, but it is possible. You can snowboard as a new parent. You can snowboard with baby on board! Here is how we ride…. My personal favorite, but it’s not for everyone. Bundle baby up and secure her to you with a tight fitting baby wrap style carrier. I love the Baby K’tan, but the Moby wrap would also be a good choice for this situation. Search for a soft powdery snow spot, with preferably no other people. Test the run by yourself first to make sure there are no hidden bumps or dangers. Snowboard down the hill with baby, and listen to those happy baby giggles! Our most frequently used option. Parent A snowboards. Parent B stays at the van/ car or lodge with baby. After 1-3 hours we switch, and high 5 each other in passing. Great option for a half day ride. Bring Granny and Gramps to the hill to spend time with baby. Works best at mountains with dinning, lodges, shops, and things to look at. Can be used pre-nap or post-nap. This option is out of my area of expertise, but I know those who have had great success with it. Bring a Nanny or Sitter on a snow trip. Possibly in exchange for the cost of their accomodations and lift ticket? Baby is entertained, and you are snowboarding. It’s a win win. The baby K’tan wrap has been an amazing baby carrier option throughout our little ones 20 months of life. It stretches and tightens and folds and wraps. I can get Baby tight and snuggle in it and so can The Husband. We are not the same size at all and Baby grows daily, but still it works. It uses the same design as the Moby wrap, but with much less fabric. We are always looking for new ways to keep the adventure going and keep everyone happy on the scenic route. If you have found other good ways to adventure with baby on board, tell me about it in the comments! These are great ideas! It’s so nice to see parents keeping up the adventures with their little ones. How long were you able to use that baby wrap? Our little one is almost 2 and I can still comfortably carry her in it! The Baby K’tan has been awesome for our travels. There was a good 2 months where that was the only way I could get her to nap. It’s a very comfy carrier so I didn’t mind wearing her in it at all.